She’s 13 years old. She’s has a 70 mph fastball. And her story upstaged the highly publicized Cleveland Brown’s quarterback battle. 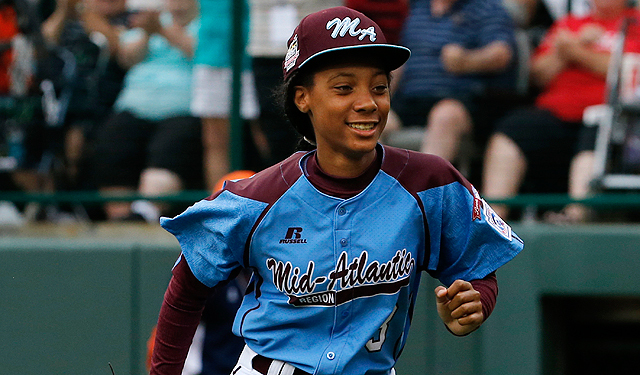 Her name is Mo’ne Davis, she’s a pitcher for the Little League Taney Dragons, and she’s the most fascinating person in sports right now. She single handily changed the infamous phrase “you throw like a girl” into a compliment. She’s poised, confident, and a bad mama jama. Three weeks ago, very few people outside of the Taney Dragrons organization knew who she was. In that short time she went from widely unknown to gracing the cover of Sports Illustrated. Her story has captivated the hearts of America and given inspiration to girls across the world. The Little League World Series game featuring Davis last night attracted 34,128 people. To put things in perspective, there were more people at this game then there were three hours away at the Pirates vs. Braves MLB game. They all came to see the pitching phenom showcase her unparalleled talent. What I find most intriguing about her is the way she’s handled herself under her accelerated rise to stardom. It’s hard enough just being a 13 year old girl playing on a team with all boys. I can imagine the jokes and harassment she most likely endured this season. (For the record, I could never make fun of a girl that throws faster than myself). However she has carried herself with grace and humility as she continues to impress on the field. With a successful future in softball seeming inevitable, Davis has voiced her desire to become a professional basketball player. Well if her skills on the baseball field transfer to the basketball court, than she may just be a force to be reckoned with. I’m sure whatever this girl decides, she will excel in. Geno Aurimemma, I hope you already set up your recruitment meeting!